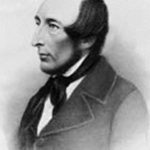 John Mitchel was born on 3 November 1815 at the manse, Camnish, near Dungiven, County Londonderry, son of the Presbyterian Minister, John Mitchel and Mary (Haslett). 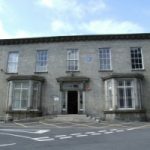 In 1823, when his father became minister of Newry Presbyterian Church, the family settled in Dromalane House. At school in Newry he met his lifelong friend John Martin. He graduated at Trinity College, Dublin in 1834. 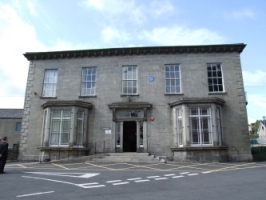 In 1840 he became a lawyer and became a partner of Samuel Livingstone Frazer, settling in Banbridge where he ran the branch office. There he met Thomas Davis, who inspired him and whose place he took on the journal The Nation, owned and edited by Sir Charles Gavin Duffy, when Davis died in 1845. In 1843 Mitchell and Martin joined Daniel O’Connell’s Repeal Association but seceded from it in 1846 with the rest of the Young Ireland party and, under the influence of James Finton Lawlor, Mitchel began to encourage peasants to withhold rents to survive the famine. Having left The Nation in disagreement with its moderate stance he founded the United Irishman in 1848. He felt that a complete break with England was necessary for the survival of Ireland. In May 1848 Mitchel was arrested under the new Treason Felony Act, convicted and sentenced to transportation for fourteen years. In Van Dieman’s Land, which he reached after spells in the hulks in Bermuda and the Cape of Good Hope, he shared a cottage with John Martin who had been sentenced to ten years transportation. 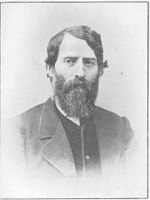 His wife and family joined him in 1851. In 1853 he escaped to America where he started a newspaper, The Citizen which serialised his Jail Journal, a detailed account of his transportation, published as Five Years in British Prisons in 1854. In surprising contradiction to his revolutionary past he was advocate of slavery, which he regarded as better than the wage slavery of industrialisation and supported the southern states in the American Civil War. When the war started he moved to Richmond and edited The Enquirer, the semi-official organ of Jefferson Davis, President of the Conferedacy. The war cost him dearly as his sons John and William were killed and James severely wounded. After the war, his continued advocacy of the southern cause earned Mitchell a five-month spell of confinement in Fortress Monroe which undermined his health. 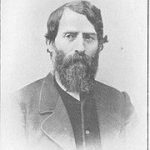 After a spell in Paris as financial agent for the Irish Republican Brotherhood, he returned to New York where in 1867 he founded the Irish Citizen. When he returned to Ireland in 1874 he was elected member of parliament for Tipperary, but he was declared ineligible as an undischarged felon, even when subsequently re-elected in 1875. He died in Dromalane House on 20 March 1875. 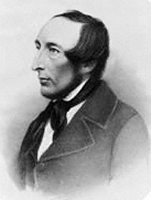 Mitchel edited the poems of Mangan and Davis as well as publishing a History of Ireland from the Treaty of Limerick and the Life of Hugh O’Neill, Prince of Ulster. 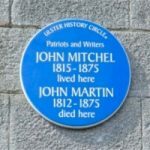 John Martin was born in Loughorne, near Newry on 8 December 1812, son of Samuel Martin, a gentleman farmer and linen manufacturer and Jane (Harshaw). He was educated in Newry, where he met his lifelong friend and later brother-in-law John Mitchel; and at Trinity College, Dublin, graduating in 1834. He began to study medicine but gave it up when he inherited property in Loughorne. In 1839 he traveled America and in 1841 Europe. In 1844 he joined Daniel O’Connell’s Repeal Association and in 1846 joined the secession of the Young Irelanders party and was expelled from the Association. With Mitchel he tried to convince Irish protestants of the benefits of an Irish parliament and when Mitchel established The United Irishman in 1848 he contributed to it. When Mitchel was arrested for treason felony Martin used Mitchel’s offices to produce Irish Felon, ‘a successor to the United Irishmen.’ whose sole purpose was to carry on the same policy for which Mitchel had been arraigned. For this he was tried and sentenced to transportation for ten years, arriving in Van Dieman’s Land in November 1849, where subsequently he was to share a cottage with Mitchel. In 1854 Martin was pardoned on condition that he did not return to Ireland. After a spell in Paris he received a full pardon and returned to County Down in 1858 to care for his orphaned nephews and nieces. In 1864 he established the National League, which lasted only to 1867, whose aim was to gain the legislative independence of Ireland. 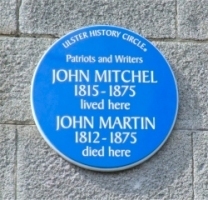 In 1868 he married Henrietta Mitchel, sister of John. They had no children. In 1870 Martin joined the Home Government Association for Ireland and in 1871 was elected member of parliament for Meath, holding the seat until his death. He was involved in the creation of the Irish Home Rule League, being elected its Secretary in 1874. Following the funeral of John Mitchell, at which he caught bronchitis, his health rapidly deteriorated. As he neared his end he was taken to Dromalane House where he died, on 29 March 1975, in the same room and the same bed in which his friend Mitchel had breathed his last. He is buried in the family plot at Donaghmore. He was affectionately known as ‘Honest John’ Martin.